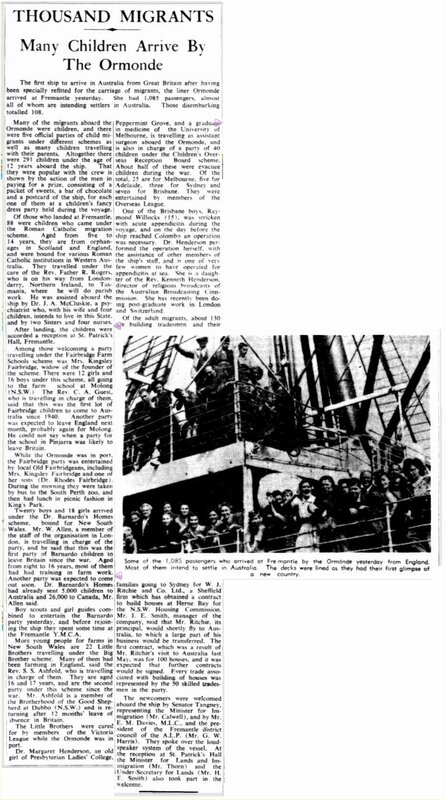 THE WESTERN AUSTRALIAN, SATURDAY, NOVEMBER 8, 1947.
dress party held during the voyage. and by two Sisters and four nurses. month, probably again for Molong. her sons (Dr. Rhodes Fairbridge). had had training in farm work. Australia and 26,000 to Canada, Mr. Some of the 1,085 passengers who arrived at Fremantle by the Ormonde yesterday from England. families going to Sydney for W. J.
migration (Mr. Calwell), and by Mr.
council of the A.L.P. (Mr. G. W.
Under-Secretary for Lands (Mr. H.
Open the article on the Trove web site.